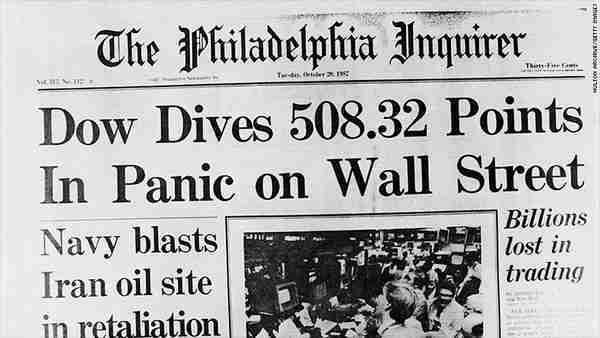 They're calling Monday, October 19, 1987, the "worst day in stock market history," it fell 22% in one day (equivalent to a fall of 5000 points today). Analysts and economists were on television all day on Thursday telling sad stories about how shocked they were on that day, but they were completely baffled about why it happened. 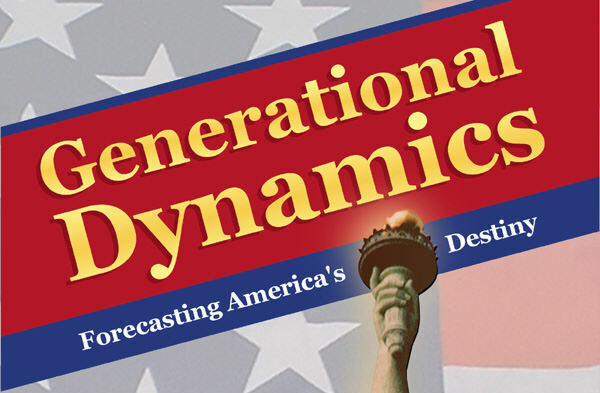 The development of generational theory and Generational Dynamics has revealed numerous important historical patterns generated by the regular changes in generations. One of the most significant discoveries in the development of generational theory is an explanation of the stock market crash of Monday, October 19, 1987 -- why it occurred at all, why it occurred in 1987 rather than, say, in 1980 or 1990, and why the stock market recovered so quickly. "What was to blame? Heightened hostilities in the Persian Gulf, fear of higher interest rates, a five-year bull market without a significant correction, and computerized trading that accelerated the selling and fed the frenzy among the human traders." Some blamed increasingly computerized trading for a wave of early sales that triggered panic among institutional investors. Others cited House Ways and Means Committee Chairman Dan Rostenkowski’s interest in market-punishing tax hikes. Still others pointed to global tensions that sparked fear of a conventional U.S. war in the Middle East and/or a trade war with West Germany. ... Journalist Tim Metz offered a more provocative theory: ... He suggests that government regulators, exchange officials and the “market makers” who sustain trading are parties to a huge — and, until now, undetected — market manipulation scheme." One of the principal causes of the crash was "portfolio insurance," which sought to protect investors by selling during market tumult. However, the computers kept selling and never stopped on Black Monday until some leading market participants ... stepped in as buyers to help stop the bleeding." Jeff Cox of CNBC claims that, unlike today, "the 1987 [stock market] was stratospheric, doubling in about two years." This is the kind of nonsense you see from analysts who have no clue what's going on. In 1987, the S&P 500 price/earnings ratio index was 14, which means that stocks were fairly priced at the historic average. Today, the P/E ratio is 25, indicating that stocks are in a huge bubble. If you want to figure out why the "the worst day in stock market history" occurred in 1987, then you have to ask what was unique about 1987 that made it different from 1980, 1985, 1990 or 1995? If you look at the proposed explanations listed above, they explain nothing. Let's take one example: global tensions, and fear of a Mideast war. Well, just a few years earlier we had had the Iran hostage crisis in 1979, and the deaths of 300 American and French troops in the 1983 bombing of the Beirut, Lebanon, barracks by Hezbollah. If global tensions caused the panic in 1987, why didn't they cause a panic in those earlier years? None of the other proposals explains why 1987 was a special year, as opposed to all the others. So why did all the senior managers of financial firms panic on October 19, 1987, and join the stock market selloff that caused the market to fall 22% in one day? If we assume that all of these senior managers were roughly 63-68 years old in 1987, they would have been 5-10 years old in 1929. Now imagine that you're a 5-10 year old child in 1929, leading a happy life with parents who have plenty of money because they had taken advantage of the stock market bubble in the 1920s. Now imagine that, one day, your parents lose everything. Your whole life is turned upside down, and suddenly your family is living under a bridge and depending on soup kitchens to survive. This is something that traumatizes you and affects your entire life. And here's the important part: It's not just you. It's every child your age. As you and your age cohort grow older, you share this common memory of the 1929 catastrophe -- something that younger children and younger people have no personal memory of. So now move forward to 1987, and you're 63-68 years old, and something happens in the stock market that frightens you. It could be almost anything. You talk it over with your other 63-68 year old exec friends, and you realize that you all recognize the danger, but that managers younger than you have no idea, because they didn't live through it before. So you all tell younger people that you think there's going to be a repeat of the 1929 crash, causing a panic. But it's a false panic, because stocks are fairly priced, not in a huge bubble as in 1929. This isn't the first time this has happened. In 1914, there was a similar false panic, occurring 57 years after the stock market crash of 1857. And, once again, the market recovered quickly from the panic, because stocks were fairly priced. This analysis by Galbraith is the basis for what I call the Principle of Maximum Ruin: That a real financial crisis will ruin the maximum number of people to the maximum extent possible. The commonly heard phrase "buy the dip" describes what happens. Since investors don't believe that a real stock market crash is possible, they buy more stocks whenever prices dip. So they keep losing money until they lose everything. This is what happened in 1929, and it's what will happen in the coming panic and financial crisis. I formulated the 58 Year Hypothesis over ten years ago when I accidentally noticed what seemed to be a remarkable coincidence. I'm now referring to the "swine flu" panic of 1976. The public became hysterical over the possibility of a new flu pandemic that could kill millions of people, repeating the catastrophe of the Spanish Flu epidemic of 1918. Responding to public demands, the government prepared millions of doses of swine flu vaccine. President Gerald R. Ford authorized a mass inoculation program, and 45 million Americans -- more than 20 percent of the population -- were vaccinated. The whole thing was a fiasco because there was no epidemic, and because hundreds of people died from a negative reaction to the vaccinations. The swine flu panic of 1976 was a false panic that occurred exactly 58 years after the Spanish Flu epidemic of 1918. Once again, the 58 Year Hypothesis explains why the year 1976 was unique. There was no similar flu panic in 1960, 1965, or 1970. It occurred in 1976 because it was 58 years after the Spanish Flu epidemic, and 5-10 year old children who had lost their parents and friends in 1918 panicked in 1976, when they were 63-68 years old, fearing that it would happen again. Once I identified this "coincidence," I began looking for other possible examples, and it turns out that the 58 year time span occurs rather frequently in generational theory. It seems that when an entire society is traumatized by an unexpected event that was foreseeable but not foreseen, then there is a panic 58 years later that the event will happen again. The Iraq ground war of 2003 is considered a mistake today, but in 2003 it was extremely populated because the entire country was anxious over Saddam Hussein's development and use of chemical weapons. It occurred 58 years after the use of nuclear weapons on Hiroshima and Nagasaki in 1945. Why was the year 2003 unique? Saddam had been developing and using WMD's for 20 years, and there was no panic. But 2003 was unique because it was 58 years after 1945. In 2006, Hezbollah abducted two Israeli soldiers near the Lebanon border. Israel went into a state of total panic, and launched the war in Lebanon within four hours, with no plan and no objectives. The war was a total disaster for Israel. There had been other prior confrontations with Hezbollah and Palestinian terrorists prior to 2006. What made 2006 special? It occurred 58 years after the genocidal war between Jews and Arabs in Palestine in 1948. "How Israel panicked in pursuing the summer Lebanon war with Hizbollah."